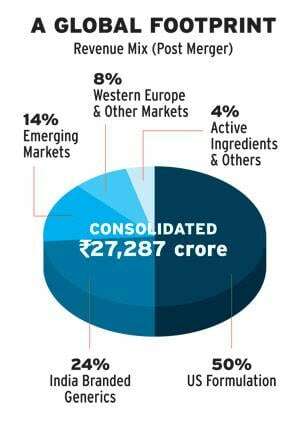 The merger helped Sun improve its average market capitalisation in the first six months of 2015/16 (April to Sept) by 49.6% to Rs 2,18,278 crore. It was a well thought out decision by the management of Sun Pharmaceutical Industries. The merger with Ranbaxy Laboratorie s was intended to help India's largest drug maker acquire scale and become a force to reckon with globally. Indeed, Sun has emerged as the world's fifth largest specialty generic drug maker. In the process, it has also vaulted into the elite group of top 10 Indian corporates in the BT500 rankings - it is now perched at the eighth spot, jumping three positions from its last year's ranking of 11. The merger with Ranbaxy, then the second-largest drug maker in the country, helped Sun improve its average market capitalisation in the first six months of 2015/16 (April to September) by 49.6 per cent to Rs 2,18,278 crore. The acquisition was announced in April 2014 and the all-stock deal at an enterprise value of $4 billion was completed on March 25. The mega deal boosted the market capitalisation and revenues of Sun Pharma but also hit the company's bottom line. The last fiscal was a very challenging year for the company, considering its impeccable track record of delivering high profits consistently and growing steadily inorganically (it has made nearly 20 successful acquisitions). "Our success of the last decade was driven by our ability to develop and launch generic and branded generic products at a rapid pace with minimal costs," said Dilip Shanghvi, Managing Director of Sun Pharma, in the annual report (2014/15) of the company. "The key determinant for success in the future will be our ability to retain these capabilities and combine them with an engine of innovation leading to a pipeline of complex generics (reverse engineered cheap versions of patented drugs) and specialty products," he added. Prima facie, the Ranbaxy acquisition consolidated Sun Pharma's position in the global generic drug industry and de-risked its over dependence on the US market. The consolidated combined revenue of Sun Pharma and Ranbaxy helped the merged entity move into the big league - it became the world's fifth-largest generic company after Teva , Sandoz, Actavis and Mylan . With Teva now buying out Actavis (part of Allergan), Sun will soon move up to fourth rank. Analysts say that Ranbaxy's global muscle is the biggest advantage for Sun, especially in emerging markets and in India. The numbers reveal the big shift. In 2013/14, Sun Pharma's consolidated revenues were Rs 16,004 crore with net profit of Rs 3,141 crore (This includes the revenues of Sun Pharma as well as its various subsidiary companies). A year later, powered by businesses of Ranbaxy, Sun's consolidated revenues jumped to Rs 27,287 crore with a net profit of Rs 4,541 crore. While India sales surged from Rs 3,692 crore to Rs 6,717 crore, US sales rose from $1,620 million to $2,244 million and rest of the world sales climbed from $316 million to $992 million. The acquisition also provided Sun a combined strength of 45 manufacturing locations across the globe, 30,000 employees and 2,000 products in 150 countries. In the domestic market, Sun also gained leadership position in 11 doctor categories, including diabetologists, consulting physicians, dermatologists and urologists. The company has a total domestic market share of nearly nine per cent, much ahead of Abbott's six per cent and Cipla's five per cent. But the merger came with its fair share of challenges for Sun Pharma. Three of Ranbaxy's plants in India, supplying products to the US, are still banned by the US Food and Drug Administration (FDA) for not complying with manufacturing standards. Then the merger was delayed by a few months due to court interventions and clearances required from various regulatory authorities. Also, legal expenses, high staff costs and one-time write-off (about Rs 600 crore) affected the profitability of the company. Margins came under pressure. In calendar 2014, after accounting for the business of Ranbaxy, gross margins fell from 83 per cent to 73 per cent, EBITDA margins dropped from 45 per cent to 32 per cent and net margins, while still better than peers in India, nosedived from 35 per cent to 20 per cent. On a standalone basis, Sun Pharma reported a net loss during the year. "For year ended March 2015, EBITDA as well as net profit were adversely impacted by a few items, relating to professional charges and implementation of Sun policies and practices on Ranbaxy for the full year. Material cost as a percentage of the net sales was 25 per cent, staff cost at 16 per cent and other expenditure were at 30 per cent," Sudhir Valia, Whole Time Director of Sun Pharma, told an analyst meet. To add to its woes, Sun was hit by manufacturing issues at its Halol facility in the US, its main supplier to that country. Price erosion in several product categories in the US is also impacting Sun. Analysts, who are bullish on Sun's long term growth, are concerned about mid-term prospects. "Sun Pharma expects revenues to remain flat or show a decline in FY 2016, as the Ranbaxy integration is expected to increase its costs. The consolidated profit in addition to revenue may also be adversely impacted due to certain expenses and charges arising out of integration and remedial actions," says Sarabjit Kour Nangra, Vice President, Research - Pharma at Angel Broking, noting that the woes of Ranbaxy integration were evident since the fourth quarter results of 2014/15. Shanghvi, who has already warned of a flat revenue and profit growth this financial year, hopes to resolve its US manufacturing issues and get synergistic benefits of $300 million from Ranbaxy by FY 2018. "Going ahead, we expect a staggered progress in its US sales because of the continued impact of price erosion and regulatory supply constraint in its largest facility (Halol). We maintain that the clearance for its Halol plant is a couple of quarters away," says Phillip Capital analysts Surya Patra and Mehul Seth. Emkay global analysts Jatin Kotian and Gaurav Tinani believe approvals for new drugs from Halol, uncertainty over launch of generic version of blood cancer drug Gleevec later in this financial year and integration of some of Ranbaxy's India businesses, such as acute therapy, will continue to be issues that bother Sun in the near term. But Shanghvi is gearing up for a bigger battle. His priority is to smoothly integrate Ranbaxy and bring the derailed businesses back on track to carry on the good work of the past. Despite issues with the integration of Ranbaxy, Sun Pharma divested a couple of domestic assets of Ranbaxy, increased research and development expenses, and acquired a couple of small overseas companies. Shangvi is now embarking on a major fund raising plan for bigger acquisitions to make Sun shine brighter.